Monday, January 5th, his Grace Bishop Mark was present for our Traditional Theophany Eve Holy Supper, organized by Protodeacon Gabriel Petorak, at St. Michael’s Center. Blessing of Homes occurred January 6th through January 10th by Fr. John, assisted by Church President, Joseph Krenitsky. We thank everyone for the exceptional kindness and warm reception given during the visit. Orthodoxy 101 - Adult Education & Bible Study Presentations were held on Tuesday evenings, beginning January 20, in the Church basement. 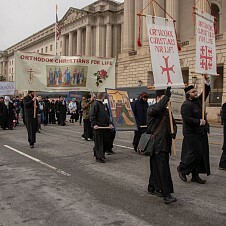 The Annual March for Life was held on January 22, 2015, in Washington, D.C. Father John attended, as well as Metropolitan Tikhon and Bishop Michael of New York and Seminarians from St. Tikhon’s and St. Vladimir’s Seminary. The Icon “The Greeting of Mary and Elizabeth” led the Orthodox March on Constitution Ave.
Father John & Matushka Kathy attended the Diocesan Assembly of Eastern Pennsylvania held on January 29th and 30th at St. Nicholas Orthodox Church in Bethlehem, Pennsylvania. Orthodoxy 101 - Adult Education & Bible Study Presentation continued once a week through the month of February, in the Church basement. The Perogie project (workers who make and assemble perogi for the ethnic food sales) occurred on February 8 and February 9th. An Ethnic Food Sale was held on Friday, February 20th at St. Michael’s Center. Fr. John and Matushka Kathy visited Minneapolis, Minnesota, on March 1. Fr. John was invited to be the guest homilist at the Sunday of Orthodoxy Service at St. Mary’s Orthodox Cathedral in Minneapolis, the largest Cathedral in the O.C.A. A Blini Breakfast was held Sunday, March 1st, following the Divine Liturgy, sponsored by St. Mary’s Altar Society. An Ethnic Food Sale was held Friday, March 6th, at St. Michael’s Center. A special collection was taken on March 8, for Matushka Katherine Baker and her children. The collected amount from our parish came to over $605. Fr. Mathew Baker, her husband, was involved in a tragic car accident and lost his life. He was a graduate of St. Tikhon’s Seminary (Class of 2008). May his memory be eternal! 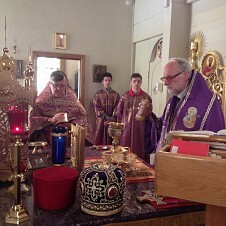 A Special Offering was taken on Sunday, March 15th, for St. Tikhon’s Seminary. St. Tikhon’s Seminary Choir sang the responses to the Presanctifed Liturgy on Wednesday evening, March 18th. Fr. Dennis Swencki was the homilist and gave an up-date on the work of the Seminary. A Lenten meal followed. An Ethnic Food Sale was held Friday, March 20th at St. Michael’s Center. Sunday evening Lenten Mission was held at our Church, March 22nd. His Grace, Bishop David of Sitka and Alaska was our special guest, together with the Deanery Clergy. A light Lenten meal in the Church basement followed the service. Homemade Pascha Bread was made Monday and Tuesday, March 30 and 31, at St. Michael’s Center. Items available were plain and raisin Pascha bread and loaves, nut and poppy rolls; kielbasi; and homemade horseradish. Lazarus Saturday Divine Liturgy was served on the morning of April 4th, followed by a breakfast in the Church basement for children of our Parish and the parents, sponsored by the P.T.A., as well as presentation of Easter baskets to our children. Shut-In Visitation was completed on April 7th. Father John attended a continuing education seminar for the Clergy of the Diocese of Eastern Pennsylvania, on April 16th at All-Saints Orthodox Church in Olyphant. Fr. John, representing St. Tikhon’s Seminary, attended a Continuing Education Conference on April 27th and April 28th at San Alfonso Retreat Center in Long Branch, New Jersey. The installation of St. Michael’s Church Committee and Center officers, Candle Men, and St. Mary’s Altar Society, took place Sunday, May 3rd following the reading of the Sunday Gospel. Mother’s Day was celebrated on Sunday, May 10th. Special Prayers were offered for the Mothers of our Parish during the Divine Liturgy. Special carnations in honor of our Mothers were sold by the Pennsylvania for Human Life – Scranton Chapter. Mother’s Day corsages were given to all women in our Church by St. Mary’s Altar Society. A Special Collection was taken on Sunday, May 10th to help defray the expenses of the Annual Memorial Day Pilgrimage to St. Tikhon’s Monastery that was held on Monday, May 25th. Orthodox Prison Awareness Sunday was May 17th in all Orthodox Parishes. A Special Collection was taken for the Orthodox Christian Prison Ministry (OCPM), of which Fr. John is the Secretary of the Board of Directors of this National Organization. Renovating Project for the furnace repair at the Church and dismantling of the stone wall and landscaping adjacent to the Rectory of the Choir Director came to a total of $3,000. This was not expected when completing the 2015 budget, so an appeal was made to use the renovating part of the collection envelopes to help defray the cost. The first organizational meeting for the Christmas in September Parish Festival for 2015 was held Thursday evening, May 21st in the Church basement. The Memorial Day Pilgrimage Collection at St. Tikhon’s Monastery on May 25th was taken by the Men of our Parish. We thank them for their devotion to St. Tikhon's. Fr. John attended the first planning meeting for St. Tikhon’s Golf Tournament Open, on Tuesday evening, June 2nd, at at Alexander’s Restaurant. The tournament was scheduled for Saturday, August 22nd, at the Jack Frost National Golf Club in Blakeslee, Pennsylvania. Fr. John participated in the Leadership Meeting of the Diocese of Eastern Pennsylvania, as Chancellor of the Diocese, on Thursday morning, June 4th at St. Herman’s Orthodox Church in Wallingford, Pa.
SS Peter and Paul 95th Anniversary Celebration Uniondale, was held Saturday, June 6, with a Hierarchical Divine Liturgy which Fr. John celebrated with Archbishop Mark. The Anniversary Banquet took place afterward St. Michael’s Center. Fr. John attended the Diocesan Clergy Retreat, Thursday, June 11, at the Holy Annunciation Orthodox Church in Berwick. All Diocesan Clergy were asked to participate as part of the 20 continual education hours all Clergy of the Orthodox Church in America must fulfill. Saint Tikhon’s Orthodox Theological Seminary hosted its annual Continuing Clergy Education Symposium June 16-18. The seminary provided this symposium to assist OCA priests and deacons fulfill their 20 hours of continuing education mandated each year by the Holy Synod of Bishops. The 2015 program was focused on theological foundations for, and the practice of, pastoral care by our clergy in parish life. Fr. John Kowalczyk gave one of the lectures on Tuesday evening, June 16th. Fr. John attended the Diocesan Council Meeting, as the Chancellor of our Diocese, on Tuesday morning, June 16th, at Christ the Savior Orthodox Church in Harrisburg, Pa.
Sunday, June 21st, Special Father’s Day Prayers were offered for deceased and living fathers at the Divine Liturgy. Special Father’s Day gifts were given to the men of our Church, sponsored by St. Mary’s Altar Society. Sunday, June 28th, a Hand Crafted Oak Reliquary from the Ukraine was blessed, following the celebration of the Divine Liturgy. The Reliquary was donated by John Lasichak for the continued good health of his family. Great Vespers was served in the evening for the Eve of the Feast of SS. Peter & Paul. The Iveron Hawaiian Myrrh Streaming Icon of the Mother of God visited our Church on Friday evening, July 3rd for a Service of Intercession and Thanksgiving. We were pleased to have this most-revered miracle-working Holy Icon of the Mother of God visit our parish. The Chicken & Rib BBQ Dinner that was held July 11th at St. Michael’s Center was a success, with over 200 dinners being served. The 18th All-American Orthodox Church Council (Sobor) “How to expand the Mission” was held in Atlanta Georgia, from Monday, July 20th to Friday, July 24th. Fr. John and Matushka Kathy traveled to attend the Sobor. Protodeacon Gabriel Petorak traveled to St. Mary’s Orthodox Church in Dubranich, our sister Orthodox Church in the Carpathian Region of Western Ukraine, on Wednesday, July 22nd for a two week trip. A Special Collection for our Sister Church was held on Sunday, July 19th during the second offering. We congratulated Alexis Bertholf on graduating from Lakeland H.S. and for becoming the recipient of St. Michael’s Scholarship. Alexis was also the recipient of a Presidential Scholarship and is attending Embry- Riddle Aeronautical University in Florida. Monthly Breakfast sponsored by St. Mary’s Altar Society was held Sunday, August 16th, following the celebration of Divine Liturgy. The Monthly Breakfast was a tremendous success with over $500.00 profit realized. Perogi Project was held the 3rd and 4th weeks in August to prepare Perogis for sale at the Festival. Assorted Cookies for the Festival were made by the women and men of our Parish, and members of the Parish donated new and vintage Christmas items for a Christmas Theme Table. These two projects were coordinated by Matushka Kathy. Theme Baskets for the Parish Festival, donated by Parish members and local businesses, were coordinated by Matushka Kathy and Debbie Bernosky. Cookie baking for the Parish Festival was done at St. Michael’s Center on September 2nd and September 9th by members of St. Mary's Altar Society. This project was coordinated by Matushka Kathy and Mary Mathena. A group photo of the Christmas in September committee was taken by Vladimir Kitchura on September 10th and submitted to newspapers for publicity. The Christmas in September Parish Festival was held on Friday, September 25; Saturday, September 26; and Sunday, September 27 which included the Classic Car Show. The Festival was a tremendous success! The weather cooperated with a magnificent and sunny weekend. Thank you to the Committee and for the generosity of all our donors and everyone who contributed your time and talents to make this project a success. On October 9th, Divine Liturgy was celebrated at St. Tikhon’s Monastery Church, for the Holy Day of St. Tikhon, Patriarch of Moscow and Missionary to America. Archbishop Mark was the main celebrant. Rev. Father Vasili Dubee was ordained to the Priesthood. He is the son of Reader Vasily and Maryanne Dubee. A workshop for Parish Council Leadership on the Statutes Revision and Proportional Giving and Proposed implementation for the Diocese was held on October 10th at St. Michael’s Orthodox Church in Old Forge, Pa. Father John, Matushka Kathy, and Dorothy Allen attended this workshop. This workshop, led by Mark Linnehan from the Financial Committee of our Diocese, was held in every Deanery in anticipation of the Annual Diocesan Assembly in January to be held at St. Michael’s Orthodox Church in Jermyn, Pa.
Rev. Father Vasili Dubee celebrated his first Sunday Divine Liturgy at St. Michael’s Church on October 18th. A reception luncheon was held in his honor, sponsored by his family at St. Michael’s Center following the Divine Liturgy. May God grant him Many Years! George and Marilyn Petorak and Joshua Petorak donated a beautiful Candle Stand, which was dedicated on October 25. Special Olympics Field Day was hosted by St. Michael’s Center on Sunday, October 25th at 1:00 p.m. God Bless all the children who competed. May our Lord grant them many years! On Sunday, October 25th at 4:00 p.m. at Marywood University in Scranton, Very Rev. Dr. John Kowalczyk, Alumnus of Marywood University, gave the opening lecture on “Witnessing the Mother of God and Her Intercessory Role in the Lives of the Saints of the Eastern Orthodox Church.” This lecture was combined with the 100th Anniversary of Marywood University and the magnificent Icons on loan from St. Tikhon’s Monastery Church, organized by the curator of the Icon Repository, Fr. John Perich. Continuing Education Seminar for all Diocesan Clergy was held on October 26th, from 9:00 a.m. to 3 p.m. at St. Michael’s Church Parlor in Jermyn. His Eminence, Archbishop Mark was present. The presenters were Mrs. Cindy Heise LMSW from the office of Review of Sexual Misconduct Allegation (ORSMA); and Church Mutual, the new insurance carrier for the Diocesan Center. On October 29th, at 6:00 p.m. at St. Michael’s Center, everyone who worked at our Annual Parish Festival and Classic Car Show, and the Festival Committee, were invited for Dinner and a wrap-up meeting. This dinner was sponsored by Tom and Faith Liuzzo as an expression of their love and commitment to our Church. The final report was given during the wrap-up dinner meeting. The net profit for the event came to a total of $23,296.00. We thank everyone for your support of our 6th Annual Christmas in September. May God Grant all of you many blessed years! A special Church Committee Meeting was held Monday evening, November 2, dealing with repair and replacement necessary at the Church Rectory and the Choir Director's Rectory. The Renovating Project Goal was set at $25,000. The Church Committee approved starting the project with the replacement of all the windows at the Parish Rectory which had to be completed before the start of winter. The cost of the 17 windows including installation came to $6,363.88. All parishioners were requested to donate in reaching our goal. Sunday, November 8th, Divine Liturgy was celebrated for the Feast of Archangel Michael and the Heavenly Hosts, Patronal Holy Day of our Parish. The Annual Parish Dinner was held immediately following the celebration of the Divine Liturgy at our St. Michael’s Center. The dinner menu included beef fillet tips with rice, stuffed cabbage (Halupki), fried chicken, eggplant Parmesan, potatoes, salad bar and desert. A special project – “Married Seminarians & Children's Wish List” – to help some of our Seminarians and their families at St. Tikhon’s Seminary have an extra special St. Nicholas Feast was coordinated by Matushka Kathy. Thanksgiving Bread was made on Monday, November 23rd at St. Michael’s Center in preparation for the St. Michael’s Center Thanksgiving Baked Goods Sale that was held on Tuesday November 24, which included the Bread, Holiday Rolls, Fresh Baked Pies, and Perogies. A Special Donation of $350.00 towards the Gold Vestments for Protodeacon Gabriel was donated by Camille Palese, in loving memory of her parents, Olga and Siegfried Palese. May their memory be eternal! A Hand-Carved Wooden Reliquary from the Ukriane was donated to the Church by Fr. John and Matushka Kathy in honor of their 40th Wedding Anniversary (October 12th, 1975) and Fr. John’s 40th Anniversary to the Priesthood (December 14th, 1975). The following relics were added to our Church: St. Job of Pochaev, St. Innocent of Irkutsk, St. Moses of Kiev Pecherersk Lavra, St. Efrem, St. Paisius Velichkovsky and St. John Chrysostom. St. Michael’s Gift Shop was restocked for the holidays. Fr. Gabriel and Matushka Kathy assisted persons wishing to make a purchase. Purchases go towards St. Michael’s Scholarship Fund. A Christmas Gift list for the poor and marginalized families and children in our neighborhood was once again organized by Susan Schlasta. A Special collection was taken on Sunday, December 13th, during the second collection. The Community Bank in Jermyn entered into partnership with our effort to help during this Christmas season. St. Michael’s Center Christmas Bread Sale was held on Tuesday, December 22nd. The baking of the Bread took place on December 21. Thank you to the bread bakers, and for your support for the sale. On Sunday, December 27, an Open House with Holiday Refreshments was held at the invitation of Fr. John and Matushka Kathy, following the celebration of the Divine Liturgy. George Petorak (Manager), Protodeacon Gabriel (Custodian), Matushka Kathy (Treasurer) for all their hard work for St. Michael's Center. Liuzzo Catering at St Michael's Center is offering catering services for the following events; Parties, Anniversary, Graduation, Birthdays, and Christenings, Banquets, Weddings and Funeral Repasts. Our Choir and its director Oleg Beljaeff for the good order and beauty found in our services and the effort involved in making our liturgical celebrations inspiring. Sub-Deacon Vasily Gardecki for managing and supporting our Parish Website: stmichaeljermyn.org. and our Facebook. The website was started March, 2007. We also thank him for his commitment in reading and serving in the Church. Diana Brotschul and Dorothy Allen for maintaining the weekly bulletin on our web-site. Our committed and dedicated Church School teachers Dorothy Allen and Matushka Dolores and Matushka Kathy. Sunday school class meets every Sunday, following the Divine Liturgy. The lessons can be found on our Church web-site on Saturday evenings. Joseph Jubinski and Joseph Krenitsky for the administrative part of the cemetery and to the Klapatch brothers for maintaining the general upkeep of our parish cemetery. Rachel Vaverchak and family in cleaning the Church, and for Joseph in cutting grass and snow plowing during the year. A job well done! Mary Mathena for her assistance in selling tickets to ensure the success of our parish celebrations. Joanne Yurchak and Ruthann Lasichak for their help in advertising our special events. St. Mary's Altar Society and all its members. They have been very energetic with many projects. They have asked all the members of our Church to participate in these fund-raising activities especially the successful monthly breakfasts..
Protodeacon Gabriel Petorak and Julie Speicher in maintaining our gift shop. St. Michael’s Gift Shop continues to generate funds for St. Michael's Scholarship Fund. This gift shop was started for your convenience, and we thank you for your support. Alexander’s Restaurant in helping the success of our fund-raising activities. Without the support and personal care from the Wanas family our chicken barbeques, ethnic food sales and other activities would not be as successful. Protodeacon Gabriel Petorak for his commitment and concern to his liturgical ministry in the Church and for his leadership role and for his hard work at our center. Our Church Center has become a blessing to our parishioners and to our Jermyn community. 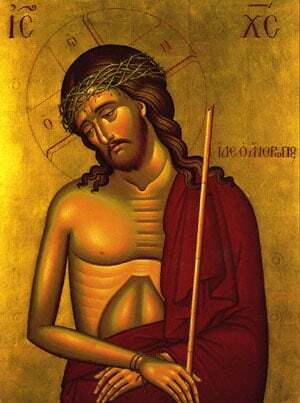 We thank him for his artistic work in organizing his faithful crew setting up the Good Friday Grave. Robert Mathena, and the Altar Boys for the weekly liturgical commitment. Joseph Krenitsky for the many years of Service as the President of our Church. We continue to be blessed by his personal example in Christian charity and of living the Orthodox faith, by word, deed and great concern for those who are hospitalized. Steve Myshak and the Vets of our church for their contributions in maintaining the Veterans memorial and for the annual Parastas. All the members of the Church Council for being faithful, reliable, and constant this past year; Ruthann Lasichak, Anne Narcoonis, Vladimir Kitchura, Steve Franchak, Barbara Palubniak, Joseph Krenitsky, To the Auditors, Marilyn Petorak, and Julie Spiecher. To the candle men of our Church and the dedication they offer on a weekly basis. To Gloria Shaw & Eva Demchak for organizing the Church envelope system. Gloria Shaw, Eva Demchak, Sam Mosely, Maryann Serafini, Steve and Jean Malec, Dorothy Allen and Mary & Robert Mathena, Jeremi and Dorcas Soroka, in helping prepare the Prosphori Bread for the church services. Steve Franchak, Peter Frenchko and Edward Narcoonis for all their work around the church, hall and parish home. John Pash Sr. for grass cutting around St. Michael's Center. Ruth Lasichak for printing the weekly bulletin. This past February, I celebrated 31 years as your parish priest.